Here it is. Now, I agonized for a good 30 or 45 seconds, and decided I did NOT want to be one of those freaks with a web site devoted to my car. So, here is one picture of our '97 Expedition in all of its werewolf killing, silver-bullet, glory. I never knew I could love a car so much, this one is awesome! 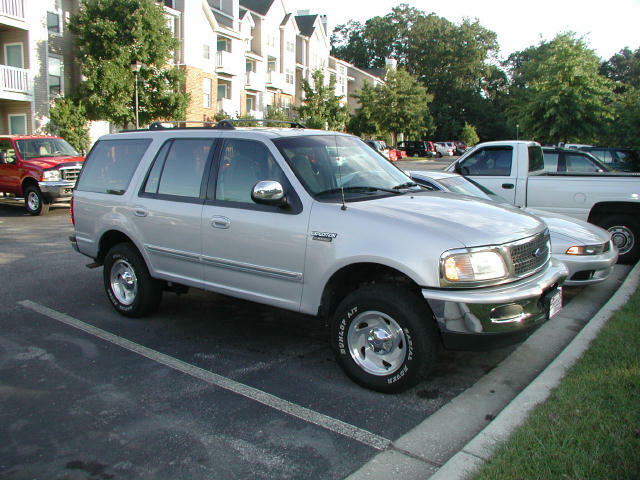 Since we sold the Kia, and now we have the Expedition and the van, I suggested we come up with new names for the cars (we used to call them the Kia and the van). I suggested we stick with the tried and true "van" for the minivan, but I wanted something better to call the new car. I suggested the Earth Killer, or Planet Destroyer, or Ozone Slayer. Claire suggested "Oslo", to which I responded we should then call the van "Stockholm". We all agreed. So now, our two american cars, are named after cities in northern European socialist countries.